Three days ago we published a translation of an ‘Announcement’ from the last page of the internationale situationniste no. 9. While nothing more than a tidbit compared to their more substantial works, this piece signals a significant step toward one of the aims of this website: to complete the translations of the entire run of the S.I.’s journal. Now the entire written content of issue number 9 is available, for the first time, in English translation (though admittedly with the exception of some very short captions to illustrations). 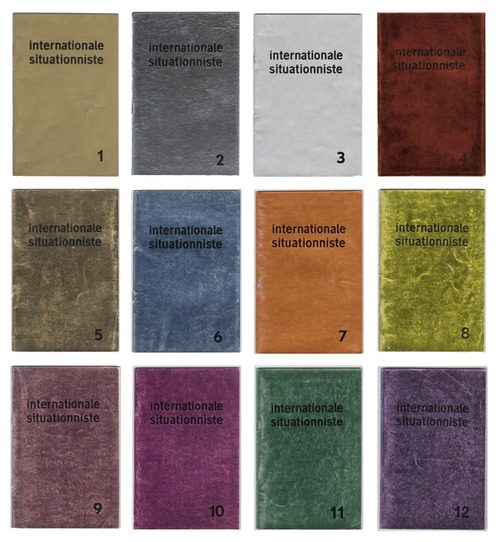 To commemorate this, and facilitate the ready access of situationist writings, we have decided to make available a comprehensive contents list of the entire run of the internationale situationniste journal. The contents list can also be accessed from the menu bar above. To begin we offer the contents of issue 9, to be shortly followed by contents for the rest of the 12 issue run. Under each journal entry you will find, in the original sequential order, the name of the article in French, followed by an English translation of the title, the name of the translator(s), and then links to English translations. In some cases there will be links to various translations; we will list these in the order of their importance, i.e. in order from the most accurate or complete translations to the least accurate or complete. For those wanting to compare these translations to the original we will also provide links to the newly available collection of scans of the original journals. We will regularly update the contents list as new translations become available. Despite the claims of various academic recuperators, or the more unfortunate attempts to “update” the situationists through a filter of decidedly anti-situationist postmodernism, we believe that the best way to understand the situationists remains reading their work. And to that end, and short of being able to read facsimiles of the original French language journals, reading their work as close as possible to its original presentation is perhaps best of all. A longer term goal of notes from the sinister quarter is to make available new translations of previously translated articles. For instance, many of the translations available on the situationist international online website are inadequate; as far as we can ascertain this website has remained unchanged since 2003. Many of the translations available there are littered with typos, though these are the least of the problems. In our view many of them are in dire need of editing and revision. We plan on offering revised versions of some of these in the near future, but in the long term it would be better to translate the originals from scratch. Ultimately it would be best to offer translations of the entire run of the SI’s journal in the same layout as the French originals. Indeed this is how the Italian translations of the journal were presented (see internazionale situazionista 1958-69, Turin: Nautilus, 1994). Such a presentation would avoid the problem of currently available English translations; most importantly they would reproduce the careful arrangement of text and image to be found in the original, largely absent from the extent English translations. This project, based on good translations, remains to be done. This entry was posted in Critique, Situationist International, Translation, Translation notes and tagged advertising, i.s. 1958-1969, i.s. no. 1 to no. 12, I.S. no. 9, internationale situationniste, internazionale situazionista, L'internationale situationniste, notes from the sinister quarter, situationist, Situationist International, situationist international online, translation. Bookmark the permalink.